Blessed Mary Angela Truszkowska was born in Kalisz in 1825, During her childhood she was drawn to prayer and care for others. 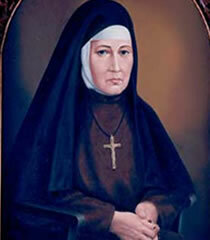 In 1825, she founded the Congregation of the Felician Sisters. Her entire life Angela was devoted to the care and salvation of all people and service to the needy. This spirit flowed from her boundless love of God and desire to fulfill his Will. Blessed Mary Angela died in 1899. She was beatified in Rome on April 18 1993 by Pope John Paul II. In our bulletin Posiew miłości devoted to Bl. Mary Angela Truszkowska you can find information about her life: her spirituality and her mission in the Church and in the world; reflection on discovering God in human reality; spiritual advice; accounts of those who experienced an encounter with Mother Angela; prayer intentions through her intercession; thanksgiving for graces received through her intercession. Our cover: The dandelion illustrates the life of Blessed Mary Angela Truszkowska. The flowery down with its tiny seeds – the bud of new life – is open to the slightest breeze. Similarly, Blessed Angela was open to the inspiration of the Holy Spirit and allowed God to lead her. Her radical availability was the beginning of God’s action in her life which brings forth fruit at the appropriate time.